The golden weeping willow (Salix alba Tristis) is fast-growing and will grow more than 50 feet tall, with branches that "weep" to the ground. Homeowners love this tree for its golden bark and bright green leaves. Like all weeping willows, the golden weeping willow is best planted on or near water banks where the soil is moist to wet. The golden weeping willow tree is hardy in USDA zones 2 to 8. Ensure the golden weeping willow is planted in the appropriate spot. The tree requires full sun and moist soil. 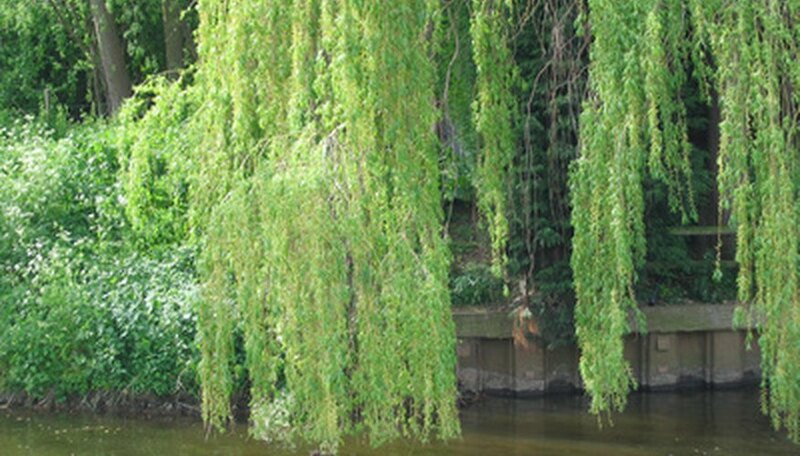 The roots of the willow can be invasive, so plant the tree at least 40 feet from water, septic and sewer lines. Keep the soil consistently moist. If the tree is not placed near water, you will need to water it frequently, especially during dry periods. Prune the golden weeping willow when it is young (under two years) to grow to the shape you desire and to develop a strong trunk. While the tree is dormant, in the late fall or winter, trim off suckers near the base of the tree. Cut off long branches toward the bottom of the tree and any that appear diseased, dead or dying. Inspect the tree for insect infestations. This tree is attractive to aphids, caterpillars, gypsy moths and scales disease. Your local cooperative extension agent can advise you rid the tree of a particular pest. Fertilize the tree once a year with a 10-10-10 formula, using the rate suggested on the package. Apply the fertilizer to the soil, and spread it about 30 feet wide.